TORNADOES -- SOME POTENTIALLY STRONG TO VIOLENT (EF2+) -- ARE POSSIBLE TODAY FROM EAST TEXAS TO CENTRAL MISSISSIPPI. OTHERWISE, NUMEROUS SEVERE THUNDERSTORMS WILL POSE A RISK OF LARGE HAIL, DAMAGING WIND AND TORNADOES FROM CENTRAL TEXAS THIS MORNING TO THE TENNESSEE VALLEY REGION OVERNIGHT. Yep. We live right on the TX/LA line right above Toledo Bend. It’s pounding the crap out of us right now, and been doing it all morning. We’re gonna get it tonight! Reporting possible EF-3 (post) report in Franklin. This is becoming the normal for our area of the TN/MS/Alabama region. Prepping for a weather event has become the norm for us in this area. I moved from the Wichita Falls, Texas, area to here and thought they were common out there and realized here they are more frequent here. Recent data has proved my hypothesis. This storm produced a tornado on the ground near Hondo Texas about eight this morning. Headed east. In my direction by Medina Lake. Fortunately we only received 3/4 of an inch of rain in about 30 minutes and just very small hail. But no tornado, no damage. 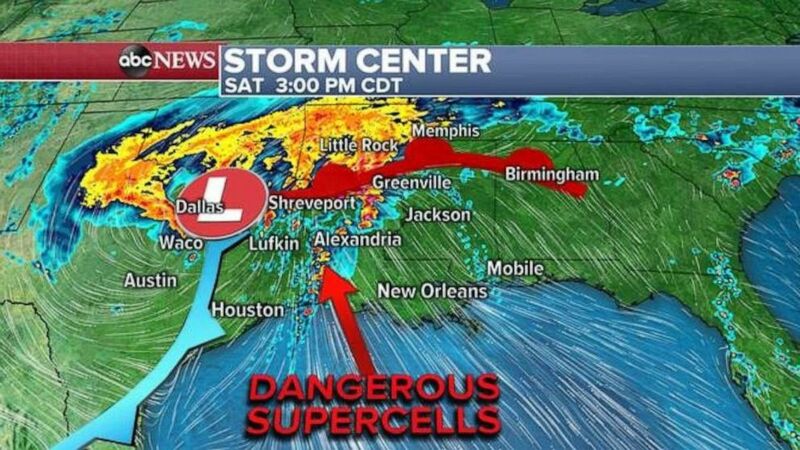 I hope everyone stays safe and damage free as this storm system moves across the South. Lots of rain thunder and lightning..has been doing this since around ten this morning..More to come this afternoon with 50 mile winds for a while.. I miss springtime in the plains. . .
That’s about as UGLY as it can get; moving very fast! Prayers Up! Sure glad I left the tornado belt. Plain Dealing in NW La, was hit on two consecutive Palm Sundays. Isn’t this the norm for this time of year?